The Research Excellence Framework also assesses the impact that the research has outside academia. The case studies below are a selection of the research submitted by the School of Psychology. Firesetting is a common, costly and tragic offence. 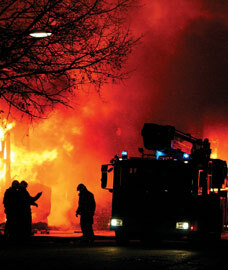 Every week, criminal firesetting in the UK causes 65 casualties or deaths and costs over £40 million. Yet, until recently, no standardised offender treatment programme had ever been developed. Responding to this need, psychologists at Kent conducted a controlled study, which found that firesetters have particular psychological characteristics requiring unique treatment. From this, the team developed the first comprehensive theory of firesetting. A standardised treatment programme was also developed for offenders within mental health services and prisons. The research is being used in the UK to provide treatment for firesetters in secure establishments and community settings. It is also being used to guide decisions on care, sentence planning and parole. Both the US and Australia have drawn on the research to inform and train their own clinicians. Sexual offenders released on licence make more risk-related disclosures – such as being alone with a child, or going to places where children might be – when they are, or expect to be, connected to a polygraph (commonly known as a lie detector). This increased level of disclosure was demonstrated in a study by forensic psychologists at Kent. The findings were discussed in the UK Parliament and legislation has now made it mandatory for sexual offenders in England and Wales, particularly high-risk offenders, to be polygraphed as part of their licence conditions. A new treatment, developed by research at Kent, can help stroke patients to overcome a debilitating disorder known as hemi-spatial neglect. This condition causes the patient to lose vision and awareness of anything happening on the left-hand side. This leads to numerous problems when carrying out daily tasks such as driving, eating and recognising people. The treatment is a painless procedure known as ‘vestibular stimulation’ that involves the electrical or thermal stimulation of the balance organs within the inner ear. Its effectiveness in treating hemi-spatial neglect was demonstrated during trials in partnership with the local NHS Trust (supported by the Medical Research Council). Other benefits for brain-damaged patients include better face recognition, the restoration of speech and improvements in conditions such as persistent vegetative state.